Rega Planar 3 Elys 2 review | What Hi-Fi? What Hi-Fi? Awards 2018 winner. Want the best value turntable on the market? This is it. We can’t think of another product that has dominated its market sector with the authority of Rega’s Planar 3 turntables. The original was launched in the late-1970s, and since then subsequent iterations have invariably remained the obvious choice in the class. The Rega RP3s haven’t changed much in appearance over the decades. Put the original next to this new one and most people would be hard pushed to find any differences beyond the smarter plinth and the updated tonearm. To date, the generational changes have always been about steady evolution, with the aim of improving performance. But by the company’s usual standards, the shift from the RP3, our current Product of the Year, to this new 2016 Planar 3 is seismic. Just about every part has been revised to give a proper jump up in sound quality, and perhaps for the first time, the company has also tried to make it look slicker too. It starts with the glossy plinth – available in black or white acrylic laminate – which is far smarter and better finished than before. The plinth is also more rigid thanks to a pair of phenolic braces on the top and bottom surfaces that strengthen the area between the tonearm and brass main bearing. That main bearing is redesigned to improve fit and reduce stress, and there are also upgrades to the subplatter, platter, motor PCB and feet. Most of these aim to improve sound, but some such as the gloss finish on the plinth and the highly polished ‘Optiwhite’ edge on the 12mm glass platter help add a touch of visual class to a product that has never bothered with such things in the past. The arm may look familiar, but here too Rega has rung the changes. It’s now called the RB330 and has a new bearing housing and redesigned arm tube. It’s pretty much a new design, then. These revisions aim to improve rigidity, control resonances and reduce friction – all good things for sound quality. The bias arrangement is clearer now, as are the markings on the spring-loaded dial that sets the tracking weight. This new arm also has better quality output cables with classier plugs. Both aspects have attracted some criticism in the past. Despite the scale of the upgrade, the 2016 Planar 3 remains what it has always been: a simple, well-engineered deck that puts performance first. This new one may look a little smarter, but the priorities haven’t shifted that much. Aside from the rubber feet there’s no real attempt at isolation here, so you’ll need to use a rigid, level support. Ideally, it’ll be positioned well away from the speakers too. All turntables, even those with elaborate suspension systems, benefit from such an environment. Rega will supply the Planar 3 without a cartridge for £550, but our sample had the company’s long-running (and rather good) Elys 2 moving magnet fitted. The cartridge works so well as part of the package that we would advise anyone to spend the extra. The Elys 2 mounts onto the RB330 with a three-bolt arrangement that ensures alignment is spot-on. Beyond finding a good support, setting tracking weight (1.75g) and bias, there's not much more to do. You still play 45s? It’s a manual speed change on this deck, which involves moving the rubber drive belt from one step of the motor pulley to the next. Once up and running it doesn’t take long to realise that Planar 3's two-year development has paid off. To our ears it sounds considerably cleaner and clearer than its talented predecessor. There’s greater transparency here and more resolution of detail too. It also becomes clear that the engaging musical character of the last generation hasn’t been diluted at all, if anything this new version is even more fun. It’s right at home with all types of music. We start off with Mozart’s Piano Concerto No.20 D Minor and are impressed by the Rega’s organisational skills. Every instrumental strand is kept neatly in place and composure maintained regardless of the complexity of the music. There’s scale here, and a surprising dose of authority. Large-scale dynamic shifts are delivered with enthusiasm while shifts of a subtler variety are handled with finesse. Tonally, things are nicely balanced. By the highest standards the Elys 2 could do with a touch more refinement at the top end, but there’s little else at this price that does notably better. Importantly, the cartridge ­– and the complete package for that matter – conveys the music with cohesion and sparkle. The Rega ties together the individual strands in such a way that the music makes total sense. The music’s message and its emotional content are communicated with utmost clarity. Some rivals may have a more etched and analytical sound but nothing we’ve heard at this price is so entertaining. This is brought home with Four Tet’s Angel Echoes. The Rega channels the irresistible momentum of this track brilliantly, delivering the sound with plenty of attack. There’s no shortage of insight either, the Planar 3 digging up layer upon layer of low level information. The good news continues with REM’s Automatic For The People. Here, the Planar 3 delivers Michael Stipe’s laidback vocals with some style. His voice comes through with its distinctive character intact – there’s plenty of texture and nuance coupled to a convincing sense of body. The gentle swing of the track is brilliantly rendered and there are equal doses of power, weight and articulation at the low end. All in all, it’s a great performance by the band, and the record deck. 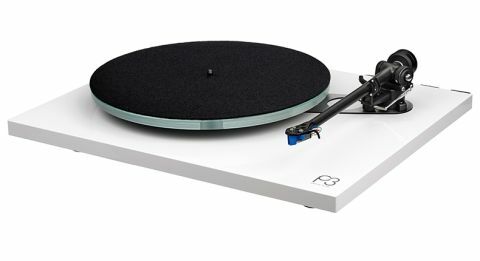 Rega has been developing the Planar 3 for decades and there’s no doubt the product has steadily improved over the years. We think this new version is the best RP3 yet, adding extra servings of clarity, precision and insight to an already musical sound. Want the best value on the market? This is it.